can be a rather remote place so I have a lot of work to do. I have included the remote Lost Coast region of Humboldt County here because this region has a lot in common with the Mendocino coast. It would take many lifetimes to fully explore this stretch of coastline. This also includes the Napa and Sonoma wine growing regions. 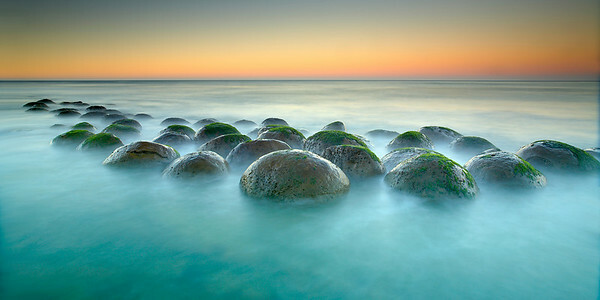 These sandstone concretions at Bowling Ball Beach, a few miles south of Point Arena, California are much like the Moeraki boulders in New Zealand. This is low tide at sunrise, which is good for reflections. 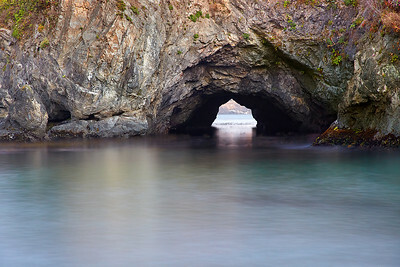 This 100+ foot long sea cave and arch is located near the center of town in Mendocino. This light is usually too harsh to get a good image so I waited for a soft, red sunset to give some warm indirect light. Then I made a long exposure to smooth out the water and focus attention on the arch and impressive rocks surrounding it. 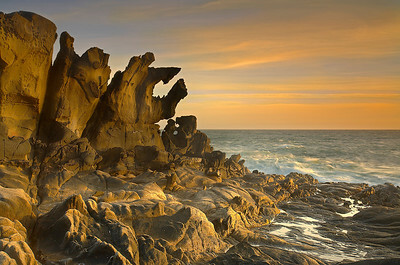 Salt Point State Park, has many unusual Tafoni sandstone rock formations like this one. Mars hasn't had water for 3 billion years, but this is what I imagine an ancient Martian ocean might look like. But this is real and here now at Salt Point State Park, 2 hours north of San Francisco. This place is covered with these formations! This rock face is only 1-2 feet thick. 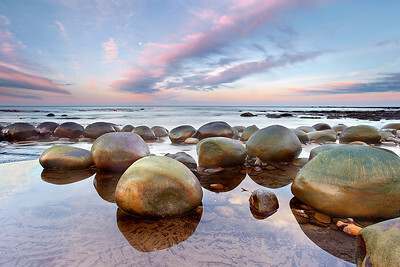 These sandstone concretions at Bowling Ball Beach, a few miles south of Point Arena, California are much like the Moeraki boulders in New Zealand. They are incredible and I'll be back here many times to capture these under different lighting and tidal conditions.